Back when my three daughters were infants, I had occasion to change their diapers despite my best efforts to avoid that onerous chore. Peeling back the diaper, it never ceased to amaze me how much ejecta could emanate from such a small source, just like Little Belknap Crater. And isn't ejecta such a nice word for <censored!>?. Surrounded by tall volcanoes such as the Three Sisters, Mount Washington, Black Crater, and Belknap Crater, the wee volcanic pimple that is Little Belknap Crater is the source for most of the lava flows in the McKenzie Pass area with the amount of lava totally incommensurate with the diminutive size of the small cone. But all that lava makes for an interesting and moderate hike on the Pacific Crest Trail through a stark moonscape comprised of all that black rock ejecta. 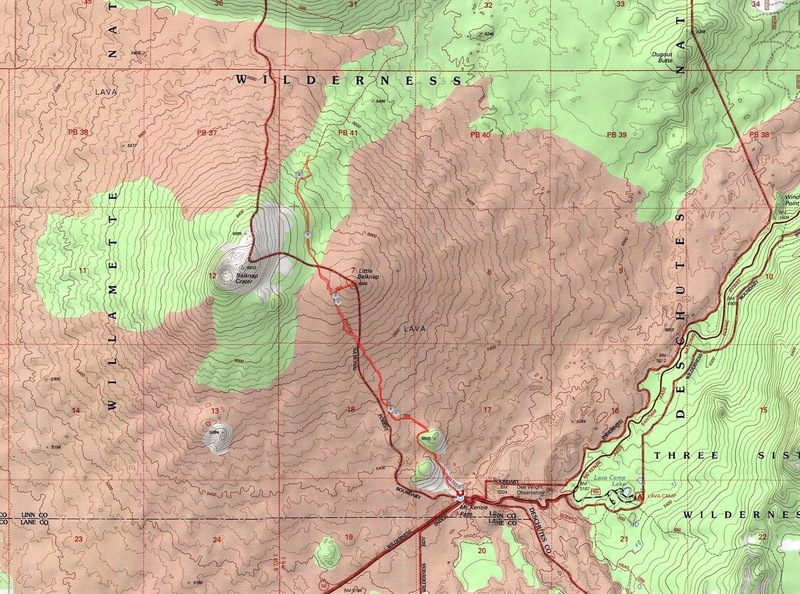 The Pacific Crest Trail begins in a forest as it contours up and over and around a pair of tree islands spared the destruction from the lava flows of a bygone age or two. Huckleberry bushes, totally gleaned of the delicious berries by passing hikers, were all turning red in a sad reminder that this summer is about to end. Entering the lava lands, it was time to say bye-bye to all the nice trees as it would be several miles before I'd see a live tree again. The PCT trail tread has been chiseled into the rock and was always easy to follow as it gained elevation. Round rocks rolled under my boots and one really has to step carefully to avoid a twisted ankle. Every where I looked was jagged rock and I gave silent thanks that there was a trail to walk on, it'd be nearly impossible to travel cross county here. Since there were no trees, there was plenty of stuff to see under a crystal clear blue sky. To the south, North and Middle Sister dominated the view, with glaciers clinging to each sister for dear life. Nearer and to the east, was the aptly named Black Crater, although it looks red from the Matthieu Lakes. But the north grabbed my interest the most as the PCT kept me pointed to the sandy tan cone of Belknap Crater and the inconsequential little red mound that is Little Belknap Crater. I actually saw two live, albeit stunted, trees attempting to survive in a lava field. A clump of dead white trees which I dubbed the "Little Belknap National Forest" gave mute testimony to the precarious existence in a would-be lava bed arboretum. After a couple of miles, a sign post seemingly in the middle of a black rock nowhere proclaimed the junction with the Little Belknap Crater Trail. A short walk down this equally rugged trail lead to its namesake crater. Up close, Little Belknap Crater did not look so little, a short but steep scramble up a bright red cliff with the scramble involving some use of hands, delivered me to the crater's summit. The views were tremendous, as from the top one can see the rivers of lava carving their way through the lowlands below the surrounding mountains. Despite the sunny day, a chill wind blew and I quickly donned a jacket and sought a lunchtime shelter in the fancy summit windbreak, complete with a couple of benches. Food tastes better with great views, and I enjoyed the already-mentioned Sisters but to the north I now could see Mount Washington, Three-Fingered Jack, and Mount Jefferson. After the Little Belknap Crater lunch-and-gawk, a short hike further on the PCT brought me to the forested jump-off point for the Belknap Crater climb. I had a little argument with myself because I had already been on Belknap Crater but I'd never been farther north on the PCT. In the end, I decided to continue on the PCT in search of a closer look at Mount Washington; I guess I both lost and won the argument. Forests must be a precious commodity here because about a half mile past Belknap Crater, the PCT entered a forest that had been recently burned in a wildfire and I walked in a graveyard of trees. Between Belknap Crater and Mount Washington, there is a large ravine of sorts and the trail began losing elevation at an alarming rate, my joy at walking downhill tempered by the knowledge I'd surely have to walk back up. Near the bottom of the slope, the snags opened up enough for an iconic picture of Mount Washington, its rocky needle rising above all the burned trees. On the return leg, I actually encountered more hikers while heading down to the car late in the day. My candidate for father of the year was a gentleman taking his three young sons on an overnight camping trip in all the ejecta. For more pictures of this scenic hike, please stop by and visit the Flickr album.